What are the parts of a handstand? Doesn’t everyone want to be able to do a handstand in the middle of the room? I can’t tell you how many people I’ve met who do. How many people are willing to do the work involved in actually making it happen? How many are willing to spend the time to create the patterns in their practice that support making this happen and then do it consistently? I truly believe that it is this part that prevents people from being able to do the handstands they so desire. I’m not going to promise you a handstand by the end of this article. 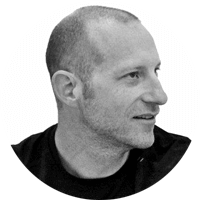 However, it is a great opportunity to see how patterns of movement and positioning in the practice feed into a yoga posture such as handstands. You may just get a glimpse of where you need to put your efforts and intention. I discuss the entire arm balancing pattern in detail in my book Functional Anatomy of Yoga starting on p. 317. 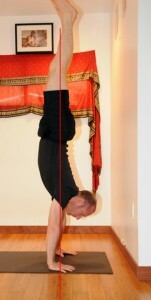 Like all postures, handstand requires a certain amount of strength, flexibility and especially technique. Without all three coming together in their various degrees how can we expect to find ourselves in the middle of the room standing on our hands with control? 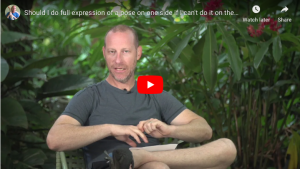 One could break the posture down in any number of ways, but I can only rely on my own experience, how I learned to do it (John Scott at right is the one that taught me), and what it has taught me about other aspects of my yoga practice. I have also watched many frustrated people spend so long on a wall or in the middle of the room flopping over into backbends when all they really want is to stay up with control. First and foremost we need a solid and stable foundation. The ultimate foundation for doing a handstand is, well, the hands. It’s not the hands that are normally the problem. If we’re fair, we aren’t really designed to stand on our hands, but we can if we really want to. The real problem or difficulty is when you follow the chain of joints upward and get to the shoulder girdle. Since our hands are playing the role of our feet in this posture we should make a quick anatomical comparison. We can see that the shoulder girdle is not nearly as stable as the pelvis and hip that we normally stack above our foot foundation. The shoulder girdle with all of its mobility and adaptability needs to be strong and stable. There are a number of muscles that attach onto the scapula and can help stabilize it. In my mind however, the single most important one is the serratus anterior muscle which lies mostly hidden under the scapula. 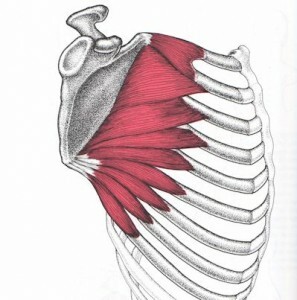 This muscle helps to keep the edge of the scapula closest to the spine pressed down against the rib cage. This is it’s stabilizing role. Just as significant, are the actions that this muscle makes the scapula do when it contracts. The two actions are protraction and upward rotation, as it turns out these are exactly the actions we do and need to do when performing a handstand. Protraction pulls the scapula around the front of the torso and upward rotation takes the humerus movement above eye level and over our head. By virtue of these actions and stabilization being combined, this muscle is crucial in preventing the chest from collapsing through the scapula. It’s also the muscle responsible for preventing the scapula from sticking up off of the back. As a result this muscle needs to be strong to help create the foundation for this and all arm balances. If you take a close look at pictures of arm balancing postures, you’ll notice the pattern that is most common between the hands and the shoulders. This basic pattern is that the shoulders sit in front of the wrist. It may perhaps be an ideal to have the shoulders above the wrist and the hips in line with that, but in my experience, very few people have the ability to do this. Instead we want to take our shoulders just in front of our wrists and sometimes further to line up with the middle of our fingers, it depends on the individual. You’ll notice in my bakasana image below, my shoulders are even further out. The first thing that normally comes up for students when I get them to do this is fear that they will collapse onto their face. This is a very natural fear, and if the shoulders aren’t strong enough, it could happen. It also shows us that we are probably missing out on a fundamental anatomical pattern that has created the strength and support that we need to hold our shoulders in this position. The second pattern is created at the pelvis which needs to be stacked above the stable and strong foundation. Part of it is positioning and part of it is about controlling the pelvis. Personally I see a related pattern between how we work our headstand and how we work our handstand. There is a pelvic movement that is similar and necessary in each of these postures if you want to do them with control. More on this in a moment. As for positioning, the pelvis needs to fit in the line moving upward from the hands and shoulders. If I were to draw a line in most people, the hands would be behind the shoulders and the pelvis would be almost in line with the hands, creating a bit of a zig zag between the three points. Look at the recent image of me at the bottom. Where is it that we create the hand and shoulder pattern? Let’s look for it. We know we’re looking for a place where the hands are on the floor. They are weight bearing and the shoulders are just in front of them. Of course, anytime we do an arm balancing posture this element is there. Put yourself into a simple bakasana position and you’ll see it. 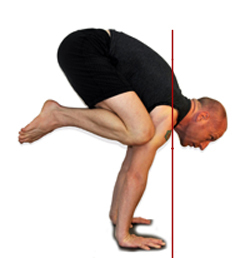 Are there other places we see this before ever doing a bakasana? If you do any type of vinyasa practice, it means you probably do sun salutations. If you do them, the moment before you jump back to a plank position you have the potential to be setting yourself up in the very position between the hands and the shoulders that we’re talking about. So many students don’t lean into their hands, much less put their shoulders in front of their wrists. Often the shoulders are kept back and when they jump, they move their shoulders even further back in space, rather than keeping them forward with weight in the hands. It’s almost as if they are avoiding the weight in their hands. If you were to both, place weight into your hands and keep your shoulders forward, you would essentially be doing a handstand as you jumped back. This is the most significant anatomical or neuromuscular pattern of handstand. It is the seed that the handstand can grow from. The question is, how many of you are willing to take the time to work this and train the tissues to support your shoulders so that handstanding almost happens on its own? Certainly any other yoga postures that we do that help create strength in the shoulders are beneficial. Even high plank and then lowering to chaturanga have their place in creating strength in both the shoulders and in the Serratus anterior to help stabilize the scapula. But, it’s when we can most closely approximate the ultimate pattern that we can do the best neuromuscular training, like jumping back. To understand the pelvic pattern we can look to headstand and the ways in which we get into it. If we begin our headstand with bent knees, squeezed in toward our chest we have two options for getting our feet up above us. 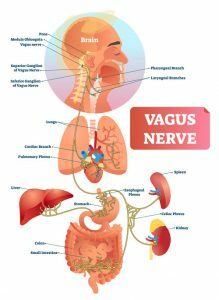 We can either initiate the movement from our feet and spring open the whole lower half of our body or we can uncurl our body first, with the spine becoming straight, leading to the pelvis tilting and then creating a slight backbend (neutral spine). From there the knees can come up with the feet, as they are moving from a well established pelvis which has already been set over the foundation of the shoulders and head beneath it. The most common negative pattern I see is people jumping up on walls, both for handstands and headstands. I must admit, if you have no strength in your arms then handstanding on a wall may help with creating the necessary strength. The potential problem with it is that it first teaches you to bypass your hand and shoulder foundation. By throwing the legs up at any cost you actually avoid using the muscles that are needed to give you that stable foundation you’ll need later. I also have to include that it avoids the abdominal and or core strength needed to help stabilize and move the pelvis in the way we described above, leading to a complete lack of control over the center of gravity at the sacrum when one eventually does try in the middle of the room. In addition most people I see doing this keep their shoulders behind their wrists and create an over arched back and shoulders. This isn’t going to train the shoulders to work in the way they ultimately need to. It teaches the pelvis to be in the wrong place relative to the hands and shoulders. Last but definitely not least, how are you going to stop the momentum created from jumping when there is no wall to catch you? You won’t have trained any of your tissues to be able to do that. Focus on finding the pieces in your practice which are feeding or taking away from your ability to even try handstand. I’ve mentioned a few. Work with them and start to feel the smallest elements of a handstand. This is all food for thought and not a complete guide in how to do a handstand. Why? Because there is no point if you haven’t established the foundation on which to do the handstand anyway. Doing this means adding more of it into practice over a period of time, not reading this, trying it four times and then thinking this doesn’t work. You need to work with it consistently. There are no shortcuts. If you want to use the wall, use it to understand where the shoulders need to be relative to the hands. See the image at right bottom. 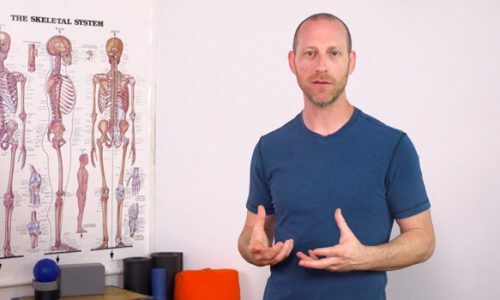 Use all of the opportunities in your practice to establish the right contractions of tissues. Hm very interesting and helfpul. I will put more attention on this. I already do the advanced chaturanga (as you described) which is helping, but did not think of the shoulders in front of the wrists or the positioning of the pelvis when at the wall. Great tips. I am also often discouraged from trying these cause I have not finished second series yet, but that is OK, I still have fun trying once in a while so it will not interfeer with the backbending etc… Thank you! Thanks for this excellent article. As a teacher I find that the greatest problem to overcome with students is the fear of flipping all the way over. They have all the necessary elements of strength but become tense at the subtle point of balance and are too rigid. It seems to be that this moment of rigidity is the factor that tips them off balance. To overcome this fear of injury I use crash mats, this has really helped one or two students to achieve the posture. From there its subtle adjustments to keep shoulders and hips stacked. well no, I didn’t wanna do a handstand, I was quite happy with the work you’ve given me for my backbends and headstands, but having read this I can see that yeah maybe, one day…! Thanks! Thanks David, myself and a girlfriend are working on that aspect of our practice, so I like the idea of the knees bent into headstand, and to try the same into handstand, but it is very difficult not to kick, will keep trying though. It’s good fun to work on this aspect of practice. A little hop is totally fine! At first we need momentum, but try to restrain yourself from kicking all the way up and missing out on the first stages of building the pattern which are really important for establishing the hand and abdominal foundation you need. To create shoulder stability in many arm balances and inversions, I’ve heard teachers cue to bring the head of the arm bones back into their sockets to integrate the bottom tips of the shoulder blades onto the ribs and create stability. In your photos, it looks like what you’re doing when you create your more aligned postures is exactly that. From my experience, it feels like almost the opposite of shoulder protraction. This is a point of confusion for me and I wondered if you could provide an insight into what happens anatomically when you draw the head of the arm bones back and whether you agree that this could create a stable base. Thanks a lot. Love your newsletter! Tuck your head in so you’re doing a straight handstand. Look down so you can see behind you and at your hands. This way your spine will straighten up and you will have a beautiful perfectly straight handstand! To clarify: you are saying that he zig zig body alignment is okay? Do you have specific exercises to strengthen the serratus? I am saying that the zig zag body is part of the process for experiencing what it takes to learn handstand. As the body opens and strengthens, the zig zag is less and less. Look through the Sun Salutation articles for more on applying serratus to practice. I’m ok if we disagree about aspects of this. As I said in other comments, this is a process. It’s not that the goal is to make the shoulders go beyond the wrists, but instead, this is part of a process of development. I would assume that most people will find straight over time.